Sometimes referred to as fake moussaka due to the omission of meat and potatoes, this recipe is a great vegetarian dish that doesn’t compromise on flavour. Salt the eggplant slices and place in a colander. Set aside for 1 hour. Meanwhile, place a medium-size saucepan over medium heat. Add 1 tablespoon olive oil, spring onions and garlic and cook for 2 minutes until the spring onions begin to soften. Add the tomato puree and oregano and season to taste. Bring to the boil, reduce the heat and simmer for 10 minutes until the sauce thickens. Remove from the heat and stir through the basil. Rinse the eggplant and dry well with paper towel. Use the remaining olive oil to brush the eggplant slices on both sides. Place a large frying pan over medium-high heat. Cook the eggplant, in batches, for 2–3 minutes each side until golden and soft. In an oiled 20 cm x 30 cm deep baking dish, cover the base with a layer of eggplant and season lightly with salt and pepper. 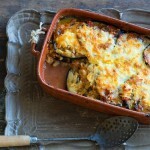 Cover the eggplant with ⅓ of the sauce and ⅓ of the combined cheeses. Repeat two more times finishing with a layer of cheese. Transfer the baking dish to the oven and cook for 35–40 minutes until the cheese is golden and bubbling. Allow to rest for 5 minutes then cut into slices and serve immediately. © 2013 Maria Benardis. All rights reserved.